Over 1 billion real time clocks (RTC) are sold each year that require power back-up to keep time when primary power fails. Clock chip manufacturers have been steadily lowering operating currents, which are now approaching 100 nA. This allows the use of Cymbet EnerChip rechargeable solid state batteries as a cost effective, small footprint, life-of-product replacement for traditional, bulkier power sources, such as coin cell batteries and super capacitors. The EnerChip can provide power from a few hours to a few weeks and can be recharged thousands of times. EnerChip solid state batteries provide new cost-lowering possibilities, such as reduced size, Pb-free reflow tolerance and automatic pick & place assembly methods. Identify the primary source of power to the unit. This is normally AC Power through an AC/DC converter or a Primary Battery. Determine the primary power source outage characteristics. For AC power, this is usually commercial AC power interruptions ranging from brown-outs to disruptions in the utility grid. For Primary batteries this is usually the time it takes to change out a failing battery or the time a primary battery has failed before user change out. Determine power outage duration. In the case of Primary AC interruption, studies have shown that 99.5% of all these outages are 4 hours or less. The outlier data ranges up to 14 hours. Please click on the RTC Back-up table above for the power outage study details. 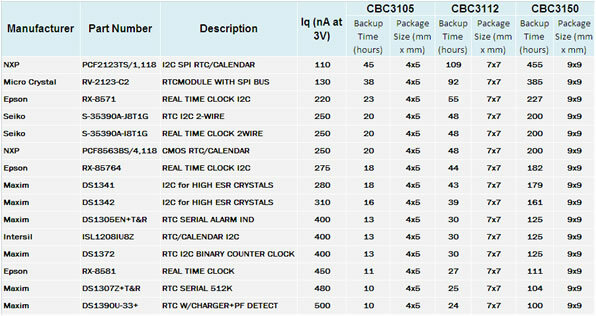 Calculate the amount of back-up power required using the RTC chip sleep current specifications. Implement a simple EnerChip CC single chip power back-solution. It’s like a micro Uninterruptible Power Supply on your board.